Harvey has arrived in Houston. Numerous flash flood warnings are posted right now across the Greater Houston area, as an eastern flank feeder band of the storm flows ashore. These heavy rains are likely to continue throughout the day today. There may be lulls at times, but the dominant weather we see in Houston today is heavy rainfall, leading to street and possibly bayou flooding. Rain totals have begun to add up. Generally 1-3″ north and east and 3-6″+ south and west since yesterday. As the day progresses, rain totals will balloon further. 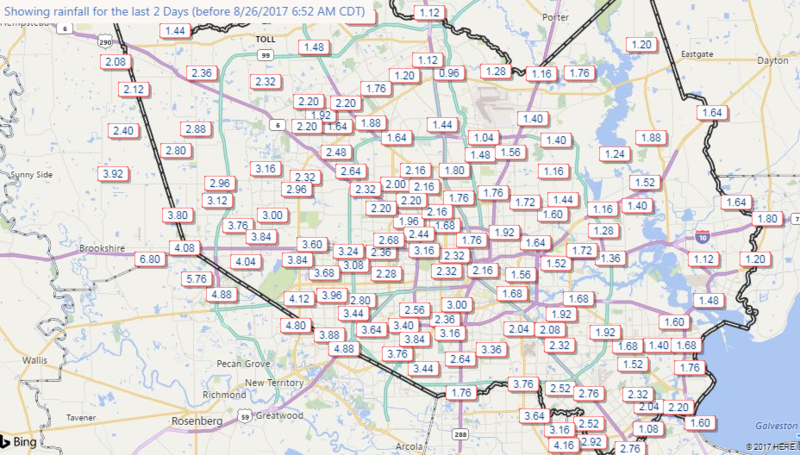 Some models show really impressive rain totals in the Houston area today. I would expect an average of 4-8″ today across the region, with higher amounts possible, especially on the south and west sides and perhaps a few spots east of the city with lesser amounts. Bottom line in all this, you need to be prepared for significant travel inconvenience and disruption today. And if you can stay put, please do so. Tornadoes have occurred overnight in some of the cells rotating in. Continue to have a way to get warnings throughout the day today, as isolated tornadoes will continue to be possible. My hope is that the pace of the tornado warnings slows a bit as the day goes on. But continue to have your phone or a weather radio to alert you. Winds will continue to be gusty at times. Harvey is weakening between Victoria and Goliad, close to tropical storm strength. It should continue to weaken from a wind standpoint as the day goes on. Still, some occasional 30-40 mph gusts are expected around Houston. Galveston will gust 40-50 mph at times. This could lead to sporadic power outages. Eric will have more on the longer-range forecast later, but not much has changed since yesterday. As we said last night: This is a marathon, not a sprint, and you should be prepared to deal with inconveniences, headaches, and travel problems for the next several days. What area does “West side” or “Southwest “cover? From Katy down to Sugarland to Missouri City to Pearland, etc. The rain was falling at around 3.5″ per hour an hour ago here in Cypress. Not a lot of accumulation until around 5:00 AM where we had about 2″ between 5-7AM We have a lull currently with no visible flooding in my neighborhood. 2.3″ so far since midnight. Very good info to see how much we’ve dealt with & compare to how much we’re projected to get. I live near Frey and Peek. I measured just under 9″ in my gauge to 0700 this morning. About 5.75″ thru 0400 and 2.50″ 0400 to 0700. Matt and Eric, I really appreciate your long hours and hard work to keep us up-to-date on the storm. Thank you so much for all you do at a time when you and your families have the same concerns as the rest of us. Hopefully you’ll be able to get some sleep soon. Any chance there will be enough of a lull for me to drive from Heights area to Clear Lake today? Trista I’m in the Clear Lake area if you need something checked on, I can try. you can email me at kjgalaxy at gmail. Raingauge at my place I just dumped and there’s only been 2.5″ since yesterday afternoon. Yes. Treat this as a rainy day. Be prudent like you would in any other rainy day. Yes, I would think so. Just check the radar and if its mostly clear along I-45 go then. Good to hear it is weakening faster than expected. Only 0.2″ while I slept (near Ellington), but we have easily exceeded that this morning with the current rain band. Out-of-state relatives are still convinced I am going to drown. I told them to stop watching The Weather Channel . This is one of their few chances to get actual viewers, and they are making the most of it. Great content without the hype! Your concise and clear updates are much appreciated. Thanks so much Matt for the update this morning. I know you said that the outlook hasn’t improved much since yesterday, but with Harvey now unlikely to hug the coastline, reconstitute, and move toward Houston, doesn’t it take the “sustained high storm surge so the bayous can’t drain” scenario off the table? That was the previously plausible scenario that was making me worry about a without-precedent catastrophic event for Houston, and as best I can tell we still have some bad days in front of us, but likely not that worst case situation? Marty: That is mostly off the table. I wouldn’t get too ecstatic over it. There is still an onshore component keeping waves/tides elevated which doesn’t exactly help matters. But yes, I guess it could be even worse. Just hope for the best the next few days. Thank you: always right without the hype. Would it be a really bad idea to try and head north from west houston right now? You doing ok? Covering this has to be costly in terms of emotion and exhaustion. It appears that we are experiencing the best of outcomes. So far. The storm is rapidly weakening, Corpus was largely spared serious problems, the rain bands are spotty enough to permit the drainage to do their jobs. I say that despite losing power twice last night. I’m enjoying myself as I have a long rod and the fishing is good. I use a pocket fisherman. Yummy! 4.25 in my two rain gauges between 8:00 last night and 7:30 this morning. Off of Eldridge, 1/2 miles north of Spring Cypress. You live right near me! Hi neighbor! Thanks for the helpful commonsense coverage and insights. We share your updates widely. Is there still a chance for it to move back into the gulf or is it going to continue moving inland? If the storm spends much more time inland it will becomes least somewhat disorganized as it loses new moist convection. Even if the remnant is pushed back into the Gulf, it will have difficulty reforming into a significant storm. The damage it did was apparently over a narrow radius from the eye. All in all we have been very fortunate so far. The best outcome would for it to take a more traditional path and move to the northeast, out of our area completely. And to speed up as it goes, reducing rain duration. What is there in the larger weather vicinity to move Harvey? Or are conditions for its lingering still prevalent? Appreciate the update. What made all this hit Houston this morning instead of later today or tomorrow (as previously predicted)? Was it greater speed of the storm or something else? No one seems to know if it will for sure turn back to Galveston. Can you let us know your thoughts? Matt, thanks for the update! Appreciate the expert coverage you and Eric, have and continue to provide us. As a Marathon runner, I like your comparison. We will have our ups and down as we head the finish line on this storm. Thoughts and prayers are with all those who are suffering. Hoping the forecast gets better and we shed this dude. Stay safe everyone. Just emptied my bird bath, or at least tried. Got excited for that little break a bit ago, thought I could actually take my dogs out. Uh, no. Question – what is the salinity of the rain we get from a hurricane? I’ve always wondered that. Should be very low. The salts in sea water have negligible vapor pressure and essentially don’t evaporate. Just like with distilled water. I know you promise no hype but could you please try and find a way to tie in the “alt-right” or Breitbart in your hurricane coverage? Thanks, signed a confused Huff Post reader. So here’s a question for my fellow readers. I only ever watch actual TV broadcasts in this kind of situation. This morning I’ve been losing brain cells watching Fox 26. Switched over to channel 2 and it seems a bit better. Which local Houston news operation do you all feel is the best, with the least hype? @Brad – none of them. Stream Netflix and read this blog several times a day, between sips of rum punch or your choice of libation. 1 – set up radio to play in the background, loud enough to hear the EAS activation tones. Who are the EAS stations in Houston? KTRH 740 AM & KUHF 88.7 FM. Personal preference is the FM (reasons can be discussed offline; hint: the one who best parallels the intent of Space City Weather). 2 – turn on the tv, but don’t achieve deer in headlights status. Volume set to background. Rotate through the KPRC, KHOU, KTRK, KRIV choices. If on KHOU and Darby is discussing traffic, look up and take note (personal preference for alternative routing in the area while parked at home). If the station starts hyping or gets overly repetitive, change channels (not every station has a reporter out in the field at the same locations, and the quality of coverage does ebb and flow). Otherwise, I am waiting for the EAS cue to wait for the tv coverage to show graphic information that I hear from the radio station. 3 – What do I do in the meantime, burn through my wifi plan by actively following THIS website, read the comments, offer hopefully helpful replies, jump to the links that appear in Eric/Matt/Braniff’s posts AS WELL AS the links offered by the people at large. Amassing a growing list with each weather event of concern. 4 – If it hasn’t been considered, twitter. Create a list with Eric, Matt, and Braniff added to it. Add in the city and county OEMs of locations of interest. If the url links offered through Space City Weather have twitter handles, add them. Other than getting media credentials and personally hanging out at the various offices, this is about as quick as any to get information from sources before they are ‘marinated’ by the well intentioned media. And, with that in mind, I highly recommend following Matt’s personal weather twitter list especially if you want to expand your horizons (one example in mind was last year’s hurricane that rode over Bermuda. Got video from the scene. Coverage from the newspaper on the island. Personal videos of the event)! Is still gonna back around and hit houston ? Weather Channel guy in Port Lavaca needs to be arrested for bad acting. My husband flew to Houston yesterday to adopt a dog. In get to spect, we should have changed this flight plans. Amazingly, they were able to fly from Houston to Boston this morning. Still in-flight. Dog flying in-cabin, so nobody freak out. I subscribed to the spacecityweather posts to follow the storm. Thank You! Some of us still appreciate facts whenever they are available and I love your less drama approach to forecasting. Thanks Matt, and great job! Stay safe. Since about 12:30 PM, zero / zilch/ nada rain near Research Forest and Kuykendahl intersection in The Woodlands. The street gutter in front of my house barely has any flow at 1:15 PM. But I realize rain likely will re-start.